Viewing 24 of 40 items. 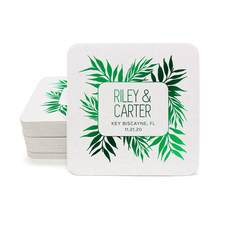 Add a personal touch to your next event with these personalized coasters. Coasters are 4" square. Your choice of stock color and imprint color. Typestyle and positioning only as shown. 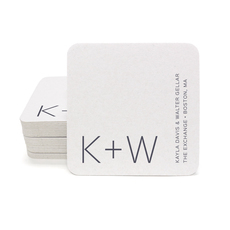 Optional..
A modern and trendy set of coasters on sturdy material. Makes a stylish gift! Coasters are 4" wide. Your choice of stock color and imprint color. Typestyle and positioning only as shown. 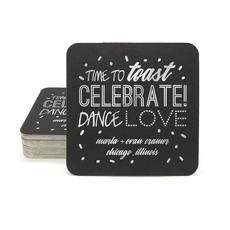 Optional..
A sweet set of coasters on sturdy material that will make your next event extra special. Makes a stylish gift! Coasters are 4" wide. Your choice of stock color and imprint color. Typestyles and.. 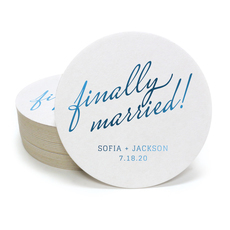 This set of coasters is a trendy way to let your family and friends know of your upcoming date. Coasters are 4" wide. Your choice of stock color and imprint color. 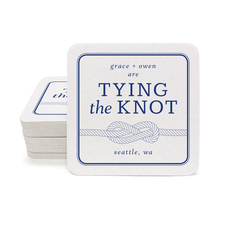 Typestyle and positioning only..
A nautical twist on a set of sturdy printed coasters for bridal and wedding or for anniversary gifts. Makes a stylish gift! Coasters are 4" diameter. Your choice of stock color and imprint.. Very chic layout! 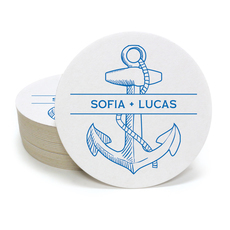 A modern and trendy set of coasters on sturdy material. Makes a stylish gift! Coasters are 4" wide. Your choice of stock color and imprint color. 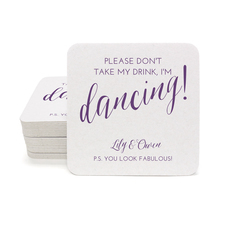 Typestyle and positioning only..
Fun and festive set of coasters, on sturdy material, will add your personal touch to your special event. Coasters are 4" wide. Your choice of stock color and imprint color. Typestyle and.. 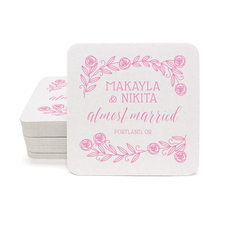 Announce your wedding date with every beverage at an Engagement Party (just an idea!) or anywhere you want. 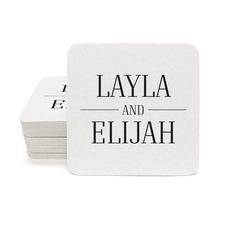 This set of coasters is a modern way to let your family and friends know of your upcoming..
A timeless set of coasters on sturdy material. Makes a stylish gift! Coasters are 4" square. Your choice of stock color and imprint color. Typestyle and positioning only as shown. 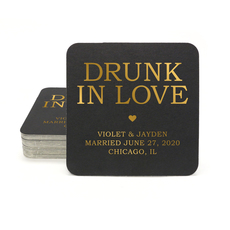 Optional..
A perfect set of coasters on sturdy material. Makes a stylish gift! Coasters are 4" wide. Your choice of stock color and imprint color. Typestyle and positioning only as shown. 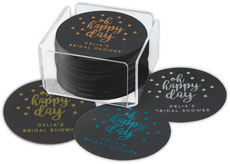 Optional acrylic..
A modern floral set of coasters on sturdy material. Makes a stylish gift! Coasters are 4" square. Your choice of stock color and imprint color. Typestyle and positioning only as shown. 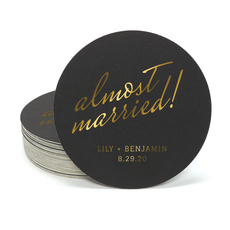 Optional..
An elegant set of round black coasters on sturdy material. Makes a stylish gift! Coasters are 4" in diameter. 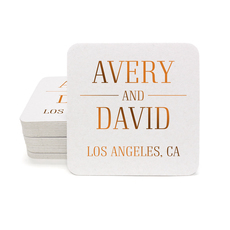 Personalization include your choice of imprint color, monogram or typestyle and..
An elegant set of square black coasters on sturdy material. Makes a stylish gift! Coasters are 4" square. Personalization include your choice of imprint color, monogram or typestyle and optional..
A modern and trendy set of coasters on sturdy material. Makes a stylish gift! Coasters are 4" square. Your choice of imprint color. Typestyle and positioning only as shown. Optional acrylic..
A set of modern and trendy set of coasters on sturdy stock will add your personal touch to your decor. Coasters are a 4" diameter. Your choice of stock color and imprint color. 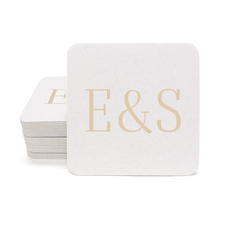 Typestyle and..
An elegant set of round black coasters on sturdy material. Makes a stylish gift! Coasters are 4" wide. Personalization include your choice of imprint color and confetti design. Typestyle only as..